Background: We report the case of a 43-year-old female patient with systemic lupus erythematosus, class III lupus nephritis, with predialysis creatinine levels around 350 μmol/L (3.95 mg/dL) after partial resection of the left kidney with histologically verified papillary carcinoma in 2010. Preoperative computed tomography of the abdomen revealed a small 8 mm tumor in the left upper kidney pole. 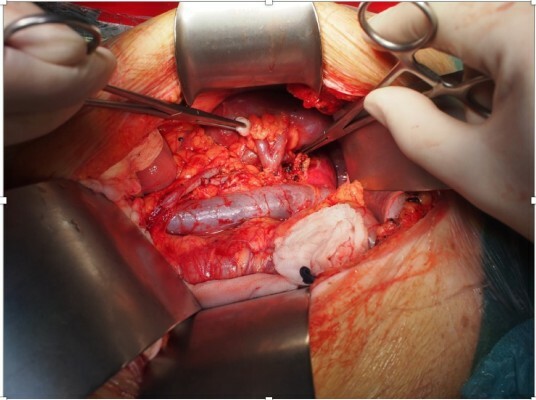 The patient was indicated for simultaneous bilateral nephrectomy and orthotopic renal transplantation with the aim to minimize invasiveness of the procedure as well as for curable tumor removal. Method: The procedure was performed under the full anesthesia trough upper middle laparotomy. As the first step, bilateral transperitoneal nephrectomy was performed. The live donor surgery started in a parallel theater to shorten the cold ischemic time of the graft. The renal graft had singe vessels and ureter; it was placed into the recipient’s right orthotopic position. End-to-end anastomosis of the right renal vein and artery anastomosis were performed; ureter was anastomosed end-to-end using recipient’s ureter. Results: The postoperative period was uneventful with repeatedly excellent ultrasonography check-up of the graft’s perfusion. The patient was discharged after 13 days with a good renal function of the graft (urea: 15 mmol/L, creatinine 160 µmol/L [1.80 mg/dL]). Conclusion: Orthotopic renal transplantation is a technically challenging but valid alternative for patients who are unsuitable candidates for heterotopic renal transplantation or in cases where there is a clear benefit of orthotopic renal transplantation.